Selected by the NBA, FIBA and the participating federations, basketball players (ages 19 & under) will converge in Johannesburg to take part in basketball instruction and competition. To promote friendship and diversity, the campers will train as teams without regard to race, religion or nationality. Congo native Dikembe Mutombo of the Houston Rockets will once again lead a group of NBA players and team personnel including Shareef Abdur-Rahim (Sacramento Kings), Caron Butler (Washington Wizards), Nick Collison (Seattle SuperSonics), Juwan Howard (Dallas Mavericks), Thabo Sefolosha (Chicago Bulls) and Jennifer Azzi of the WNBA, as camp coaches and mentors. Lance Blanks (Cleveland Cavaliers), R.C. Buford (San Antonio Spurs), Amadou Gall Fall (Dallas Mavericks) and Masai Ujiri (Toronto Raptors) will once again oversee as camp directors. In addition to basketball instruction, the players and coaches will lead life-skills seminars that promote education, leadership, character development, health and wellness throughout the four-day event. Highlights of the camp will include extensive community outreach efforts that will culminate with the unveiling of a safe place for children to live, learn and play in Johannesburg. 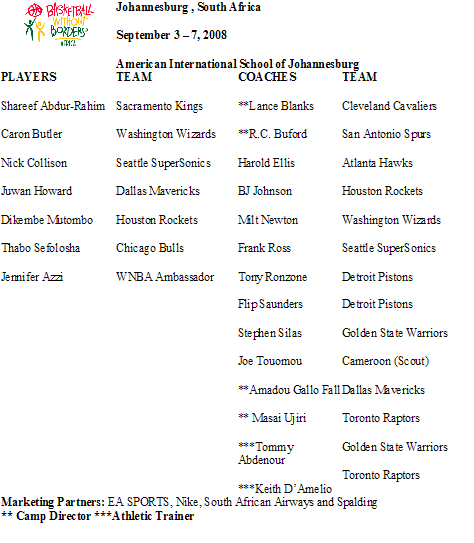 Basketball without Borders Africa will feature Nike, EA SPORTS, South African Airways and Spalding as marketing partners. A Basketball without Borders marketing partner since 2002, Nike will again outfit all the camp participants and coaches with Nike footwear and apparel. The camp will also include extensive community outreach efforts by the NBA, FIBA and their partners that will include the creation of safe places where children and families can live learn or play. Since 2001, NBA Cares has created more than 400 live, learn or play centers around the world. Before traveling to South Africa, the BWB Africa contingent of players and coaches will conduct a basketball camp in Dakar, Senegal in support of Sports for Education and Economic Development (SEEDS). Based in Senegal, the academy was founded by Amadou Gallo Fall, a BWB Africa camp director since 2003, and Dallas Mavericks director of scouting and vice-president of international affairs. In addition, Jennifer Azzi, former WNBA All-Star and Olympic Gold Medalist will join the coaching staff in Africa, becoming the first woman to participate in Basketball without Borders in that capacity. To date, Basketball without Borders has featured over 250 current and former NBA players, coaches and team personnel from 30 different teams who have served as camp coaches and mentors for over 1200 young athletes from more than 100 countries and territories on five continents. This year Basketball without Borders Asia will be held in New Delhi, July 3-6 marking the NBA’s first event in India; Basketball without Borders Europe returns to Istanbul, Turkey, June 4-7.